The island nation hopes the token will help solve its budgetary woes. On February 26, the Republic of the Marshall Islands (R.M.I.) passed a law approving the launch of Sovereign (SOV), the first cryptocurrency issued as legal tender by a sovereign nation. “This is a historic moment for our people, finally issuing and using our own currency, alongside the USD. It is another step of manifesting our national liberty,” said R.M.I. President Hilda C. Heine in a media release. Neema, an Israeli startup, is developing the technology to support SOV and will oversee both the presale and the coin offerings. “SOV will mark a new era for cryptocurrency,” said Neema CEO Barak Ben-Ezer in the media release. “SOV is about getting rid of the excuses why not to shift to crypto — it’s real money, and it provides the golden path between an open ledger and total anonymity. It gives users the power to decide when and what to disclose,” he added. The timing of the R.M.I.’s decision to issue a cryptocurrency is likely linked to budgetary concerns. The U.S. currently sends the R.M.I. $60 million in foreign aid every year, but in 2023, that figure will drop to $30 million. According to the R.M.I. media release, the nation’s entire budget is $100 million, so it stands to lose nearly a third of that budget just five years from now. To combat the turmoil the drop in aid is likely to cause, the island nation plans to place 50 percent of what it earns via its initial coin offerings into a national trust fund. The R.M.I. will split the rest of the money across three areas. Between 1946 and 1958, the U.S. used the R.M.I. as a nuclear testing site, so 20 percent of the remaining funds will go toward providing citizens affected by those nuclear tests with healthcare and support. The R.M.I. will place the final 10 percent into a Green Climate Fund. The nation is highly susceptible to the negative impacts of climate change, and this fund will help it transition to clean energy and address issues like overfishing. While it is not the first nation to dabble in cryptocurrencies, R.M.I. insists its SOV is unique, noting in the media release that Venezuela’s petrol (PTR) is not actually the nation’s legal tender. Of the other nations that have recently considered cryptocurrencies — Iran, Russia, and Israel — none have committed as much as the R.M.I. towards the initial venture. 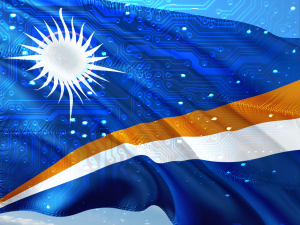 Ultimately, the Marshall Islands could emerge as a shining example for others to follow on the road to legitimizing digital coins, or a cautionary tale illustrating what can go wrong when governments get involved with cryptocurrencies.